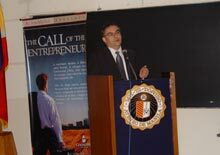 Acton Media, the Friedrich Naumann Foundation (FNF) and the Brotherhood of Christian Businessmen and Professionals (BCBP) hosted the Manila film premiere of The Call of the Entrepreneur on 10 November 2007 at the Ateneo Professional Schools, Makati City. The film looks into the lives of three different entrepreneurs: a merchant banker, a dairy farmer and a refugee from China. In discussing the role of individuals in creating wealth, the film dispels the criticism that entrepreneurs are “greedy capitalists,” and that business and Christian ethics are incompatible. On the contrary, it shows that entrepreneurship is a morally legitimate vocation, producing ideas and innovations that benefit humanity. FNF Resident Representative Siegfried Herzog welcomes the crowd. 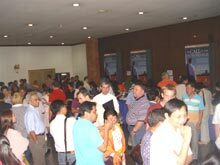 The film premiere capped off the two day visit of Fr. Sirico and Acton Executive Director Kris Mauren. 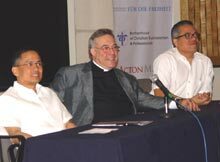 While in the Philippines, they had met with the Center for Research and Communication, the BCBP, the Foundation for Economic Freedom, the Philippine Center for Entrepreneurship (PCE), the Bishops-Businessmen’s Conference for Human Development and religious educators. “Economic freedom is a key advocacy of the Friedrich Naumann Foundation,” Siegfried Herzog, FNF resident representative, pointed out. “That’s a concern we share with the Acton Institute. The Call of the Entrepreneur teaches us that economic freedom is not just useful from a utilitarian standpoint, but that it has its own intrinsic moral justification – it’s the precondition for people to develop their full potential as human beings,” he added. “This is brought out by the emphasis on the creative side of entrepreneurship. Liberalism and the Church have often had an uneasy relationship. We are glad that we had this opportunity to work together with the Acton Institute on a positive advocacy that is imbued by deeply held shared values,” he concluded.